“Hola, Espanol!” says my daughter, giggling, as she runs out of the Panaderia. In her hand, she holds a small pastry generously offered by the owner. Then, she runs across the narrow street to the village Plaza and sits on a bench to savour her sweet chocolate-filled mini croissant with a delicious honey-nuts topping. It’s 11 am on beautiful Thursday in November and the Plaza is bathed in the sun and bustling with life. Today is market day. The locals are shopping for fresh produce, leather purses or pajamas and socks. Nearby, at the Caffè, a few climbers are sipping café con leche and catching up on emails, eyes glued to their laptops. The temperature is cooler at this time of year and therefore no one rushes to the crags before noon, especially the shady ones; the mythical ones. No one rushes to the crags but us. On a ten-day vacation with young children, we want to maximize every hour of daylight to explore and enjoy this huge climbing playground. Time is limited and family vacation also means we are here to spend quality family time. Although a tiny little village, Chulilla is an enorme climbing destination. After timid developments in the 90’s, local route setters have been very prolific in the last few years, with increased community support towards this major tourism draw. The spot now counts over 800 routes dispersed across a dozen different areas, some located at walking distance from the village and some a little further away in the valley. The quaint, white-washed village is perched on a bluff and surrounded by countless kilometres of bright limestone walls, perfectly vertical or slightly overhanging. The climbs are known to be long and tenuous. It isn’t uncommon to link beautiful technical moves for 40 metres and even 50 metres in one single climb. Climbers must come prepared: strong forearms, eighty-metre ropes and lots of quickdraws are required to make the most out of a stay in Chulilla. While the area offers climbs that range from 6a to 8b, Chulilla is an absolute paradise for 7b climbers, grade in which many of the most iconic climbs can be found. This is a little unfortunate for us, who happen to be modest climbers in comparison to many visitors to this destination. The information we hold prior to our arrival is that routes in the 6th and low 7th grades can be found but can prove a little runout or polished. Nonetheless, the place still looks appealing to my dear husband, our loyal climbing partners Marc and Shenoa and myself, and we feel confident about finding nice climbs to play on. In such a large destination with all the many different sites, the local climbing guidebook Chulilla: Guia de Escalada is absolutely essential, but requires some studying. Fortunately, after day 2, we realize that there is some excellent climbing in our grade with plenty of newer climbs on excellent rock and very well equipped. Sectors like Fantasia, Cherales and la Peneta is were we end up spending a lot of time, in the warm autumn sunshine. These areas never seem crowded although very easily accessed. Most of those sites however, are not very toddler-friendly. The sites that we find fit and welcoming to families are La Nevera that is of easy access and has fun caves for the little cavemen. Competicion is the best area we found to set up a small top rope for the kids and is also an easy end-of-day crag on our way to the bar. Finally, we also enjoyed another small crag in the canyon between the bridges for the great hike it provides, the river and the fine sand. We find however that the best way to maximize our time on climbing days is to split up our group into two teams; one team to look after the children for the half-day while the other team climbs. 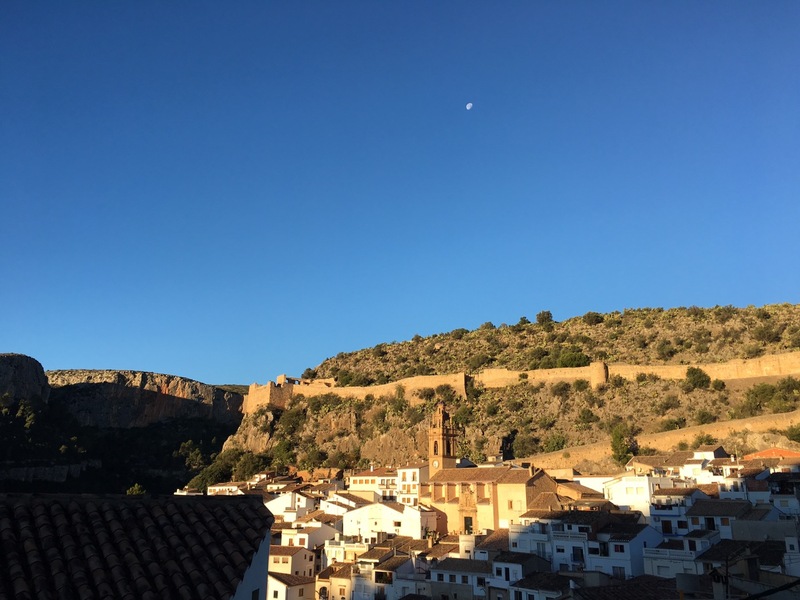 There are plenty of fun things to do with the kids around the village between exploring the narrow cobbled streets, playing princess & knight in the Castillo, paying a visit the white fluffy goats, hiking the river valley or simply enjoying the local delicacies and running around on the Plaza. Chulilla also has two decent playgrounds, of which one is located by the local watering hole, wifi hotspot and tapas and climbing beta provider; Goscanos. Fortunately , we also have opted for a comfortable and spacious four-bedrooms vacation rental, la Casa Nispero, which is located on a large gated property and the end of a quiet street where the little ones are free to roam. The location and amenities of the house really contribute to making our stay enjoyable, from the ability to cook healthy meals at home to the cozy evenings by the wood fireplace, pool-side lunches and naps in the sun…as well as the two bathrooms. There are also many other vacation rentals right in the village to suit every budget and group size as well as cozy inns and hostels, the main one being El Altico, owned by one of the prolific local route setters. Many climbers also stay in camper vans around town or on the main public parking lots, with access to water and wifi at the nearby climber’s bar. The village hosts several small mercados or carnecerias where one can find most of the staples to survive: cheese, bread, wine, meat and charcuterie, oranges and mandarines in season, local and absolutely divine. For more diversified foods, the nearby city of Lliria or Valencia are the best options we found to please our little and big eaters. In Chulilla, the spirit between locals and climbers from all around the world is truly positive, especially when the climbers happen to have ninos, who are the best conversation starter and get a very special attention from every store or restaurant staff. Even with a limited proficiency in Spanish, it is very easy to communicate with residents who are so friendly and welcoming and never seem on a rush. In the small climbing shop, visitors can buy all the staples including the guidebook. The store also carries t-shirts and hoodies with Chulilla’s tagline: Climb. Eat. Sleep. F**k. The sight of it makes me think that it’s probably what defines a stay in Chulilla for most climbers, single, young and beautiful, although we definitely noticed an imbalanced male vs female ratio. Obviously, going on a rock climbing trip with toddlers changes your experience … a lot. I think it’d be more accurate to summarize our experience in Chulilla this way: Sleep. Climb. Eat. Play. Nap. Snack…and wipe bums.